Jaws may have forever frightened folks about great white sharks, but some real-life shark hunters this spring offer a gentler lesson about the species — front row seats on a search for a shark nursery. Don't worry, there's still plenty of snapping jaws and saltwater drama, though. 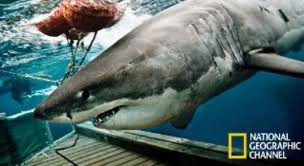 Starting Sunday with a double episode, Shark Men (National Geographic Channel, 9 p.m. ET premiere) returns for its second season of shark wrangling. This year, the team travels from theGuadalupe Island about 150 miles off the Mexican coast, to Malibu, to the Gulf of California in search for the breeding ground of great white sharks cruising California's coast. "There are some fundamental puzzles of the great white sharks," says expedition leader Chris Fischer ofOCEARCH, a nonprofit ocean conservation group based in Washington, D.C. "The really big one is finding out where female ones are going to have their pups."